Eloy Jimenez is doing some pretty remarkable things as a 19 year old for the South Bend Cubs. He cracked two homers yesterday, here is video of the second one. 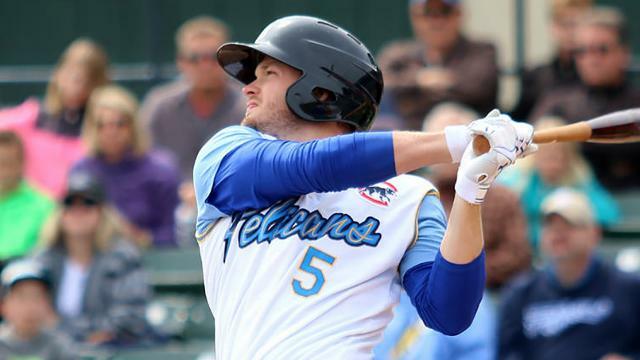 We are now about a month into the season, seems like a great time to take an early look back at the 2015 draft and how those players are performing in their first full professional season. Most of the players that have the “has not played in 2016 yet” note will start up in June with the Eugene Emeralds, or play in the Arizona Rookie League. 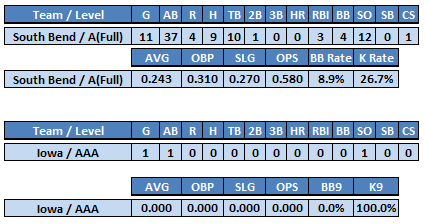 Ian Happ, and Donnie Dewees appear to be living up to their draft status as they have both started 2016 very well, the production from Happ has been impressive, and Dewees is racking up the total bases without hitting a dinger. The trio of pitchers taken in the top 10 rounds are finding success in the early going, all three (Kellogg, Berg, and Brooks) have been awfully impressive. It will be fun to check back in on this list down the road once all the teams get their season going, and also see the progress these guy make throughout the year. Huge home run from Dan Vogelbach last night, a grand slam in the sixth that put Iowa in front for good. Opposite field no less, the big man is crushing the baseball.